Colored diamonds are among the rarest and most coveted gemstones on the planet today. Their legendary nature dates back to ancient times, and they continue to remain some of the most awe-inspiring stones in the world. In fact, only one in 10,000 diamonds has a vibrant color, and the most expensive gemstone ever auctioned – the Graff Pink Diamond – sold for a staggering $46,000,000. These diamonds are rare, beautiful, and superbly valuable, and they would make a great addition to your very own custom engagement ring. 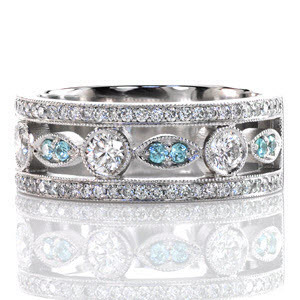 At Knox Jewelers, we have extensive experience in working with all kinds of gemstones, including colored diamonds, and we would love to have the opportunity to design a work of art just for you and your loved one. Let’s take a closer look now at the history and background of colored diamonds to see just why they’re so special and valued. Ancient India is the origin of the world’s first color-grading system for diamond stones, wherein they served as a mark of honor and reputation in the caste structure of the country. Depending upon an individual’s specific role in society, they were permitted by the ruling castes to wear one of many different known colored stones of that era. Since then, the jewelry industry has adopted a number of more modern grading systems for these diamonds, and these systems continue to evolve as the years march forward. Sources of colored diamonds include Southeast Asia and South America in a variety of different countries, including Brazil and Indonesia. From Australia, the Argyle mine produces stunning pink diamonds – among the most coveted of this class of gemstone. 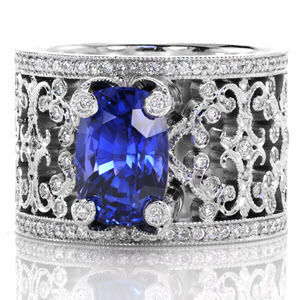 Although many of our clients are familiar with the classic gemstones such as sapphires, rubies, and emeralds, many of them are not so familiar with colored diamonds. Nonetheless, these diamonds can easily match the beauty of the former gemstones, and they are bound to make a great addition to any piece of jewelry. After all, there is nothing quite like having a stunning colored diamond center stone to adorn your engagement ring or other jewelry. 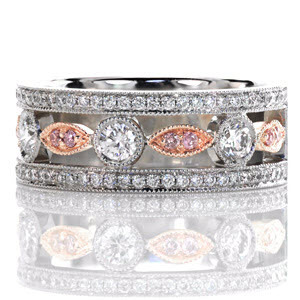 Colored diamonds are certainly making a comeback in the industry today, and “fancy colored diamonds” – that is, diamonds which have rich hues and intense colors – are among the most prized by both designers and customers. Colored diamonds are achieving this new found popularity by combining those qualities which make more traditional gemstones like ruby and sapphire so renowned with the durable and enduring properties of diamond. Without a doubt, these rare gems will continue to gain market share and repute. At Knox Jewelers, we are experts in designing heirloom jewelry that will last for countless generations and stand the test of time. We want to help you design a custom engagement ring with a colored diamond center stone that truly evokes feelings of love, loyalty, and family – all the necessary ingredients in the creation of a true heirloom. We are proud to help our valued clients to physically manifest these eternal bonds and relationships, and we look forward to helping you create your very own design. We start with a consultation to determine what your goals are for the piece. Then, we help you select the perfect center stone. Finally, we will make final adjustments to the design and select a metal for the base. 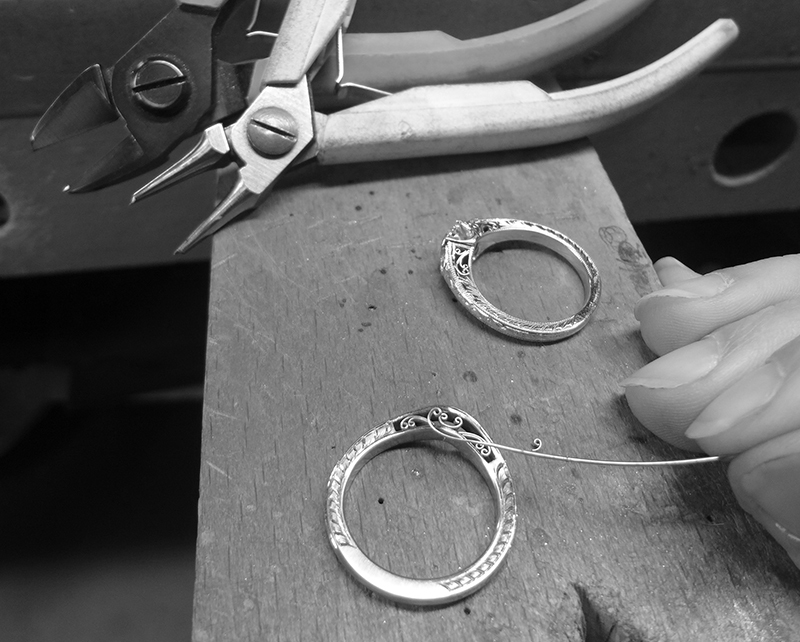 As our talented jewelers bring your creation to life, we’ll send you photos of its progress along the way. This process is truly intimate and one-of-a-kind, and you’re sure to remember it fondly well into the future. Have Any Questions? Let Us Know: We’re Always Happy to Help! If you happen to have any questions at all about colored diamond stones or the jewelry creation process at Knox Jewelers, please be sure to let us know. We’re always happy to answer any questions you may have, and we look forward to working together with you to design a work of art that will last and be passed down throughout the ages. Get in touch with our friendly and professional staff today, and we’ll get started on the journey to creating your very own, one-of-a-kind piece of custom jewelry. Princess cut diamonds are one of the more exquisite styles of diamond cuts. In fact, it’s one of the most popular diamond cutting styles on the market today – and for good reason. 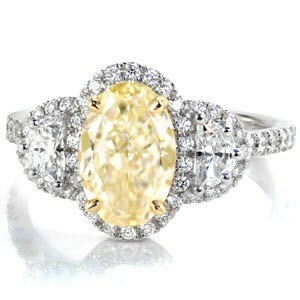 This cut incorporates a number of techniques which allow for a high level of brilliance with a unique faceting style that makes it distinctive from the more traditional round brilliant cuts. 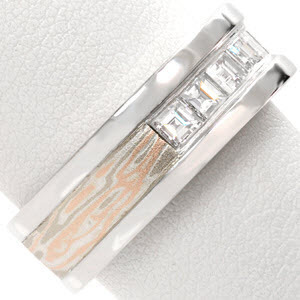 Instead, the Princess cut is typically square or rectangular. Let’s take a closer look now at the history of the Princess cut, its variants, and some important considerations to keep in mind when choosing Princess cut diamonds for your jewelry. Although the Princess cut partially derives its existence from the older, more venerable “French” cut, it did not come into being until the 1960’s. It has definitely kept pace with its competitor, the round brilliant cut, and it is continuing to grow in popularity among our clients here at Knox Jewelers. While the Princess cut may lack the long history of other types of cuts, it more than makes up for that with elegance, precision, and brilliance. No wonder it’s the second-most popular type of diamond cut on the market! Customers who have chosen this cut for their engagement ring agree that the Princess cut is one of the most elegant shapes out there today. As you might imagine, not all Princess cut diamonds are created equal. 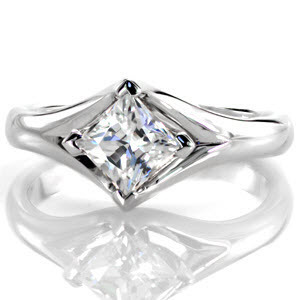 For instance, some Princess cut diamonds may have greater depth, polish, or symmetry than others. 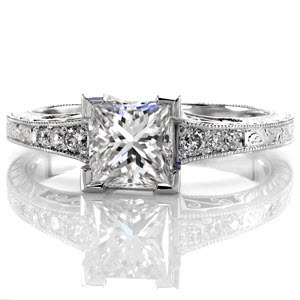 To make the process of choosing the right diamond for your Princess cut engagement ring as easy as possible, our expert jewelers here at Knox Jewelers will ensure that your ring has only the finest diamond which balances color, clarity, and depth. After all, there is no industry-wide or standardized consensus on the specific grading of cut on Princess stones, so you’ll want expert guidance in choosing the right one. We have the experience necessary for helping you to make the right choice. Each and every design at Knox Jewelers is created by hand and from the ground up – none of our jewelry comes out of a factory. Our artisans and craftspeople are some of the most well-regarded experts in the industry, and we have had the privilege of designing many engagement rings for our valued clients. Be sure to have a look at some of the custom engagement rings we have designed in the past – if you’re interested in incorporating a similar design into your own Princess cut engagement ring, then we would be absolutely thrilled to create a ring that is tailored to your specific desires and ideas. The most important consideration to keep in mind if you’re thinking about investing in a Princess cut diamond for your jewelry is this: Although Princess cut diamonds are very beautiful, their corners tend to be less durable than you might expect due to the way the cut is made. 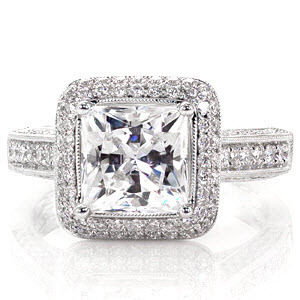 Although we have set many Princess cut diamonds into our handmade, custom-tailored designs for our satisfied customers, we generally recommend that those customers who are looking for crisp and straight edges on their center diamond, to instead opt for a Radiant cut with a square ratio. We usually recommend this option whenever possible due to the improved stability and robustness of the resulting cut. Aside from this important consideration, the Princess cut is an excellent choice for practically any unique engagement ring! Designing a unique engagement ring with our expert staff is an experience of a lifetime. We will work together with you from start to finish to create a Princess cut engagement ring that encompasses the visual and emotional motifs you want to see incorporated into it. There exists perhaps no experience more fulfilling or significant than being able to design a piece of jewelry which symbolizes the love you share with that special someone. We encourage you to get in touch with our friendly staff today and we’ll get started on the process of designing a truly significant engagement ring just for you. 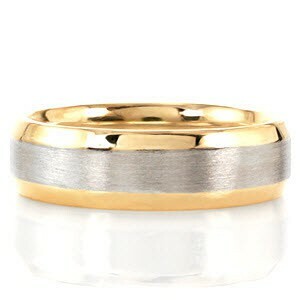 What do you think about wide-banded rings and wide wedding bands? 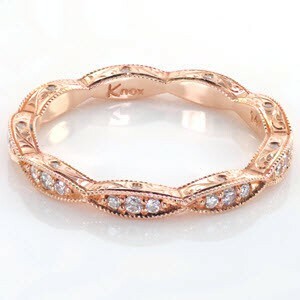 Most commonly, our customers at Knox Jewelers order wide bands for use in wedding rings or as anniversary bands. But, these rings are starting to evolve in terms of their function. Today, it is not uncommon to see individuals wearing a wide band for no other reason than “just because,” and that’s great news! When our designers have the opportunity to work with a wide band, they can incorporate far more creative ideas and visual motifs into their designs than when they do not have has much real estate with which to work. When it comes to ring design, every millimeter counts, and wide wedding bands give us a huge canvas from which to craft something truly amazing. But, don’t just take our word for it – let’s have a look at some of these magnificent and unique wide-band design styles. 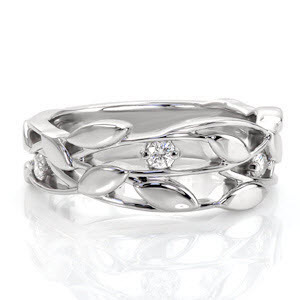 These elegant styles capture some of the beauty of nature. 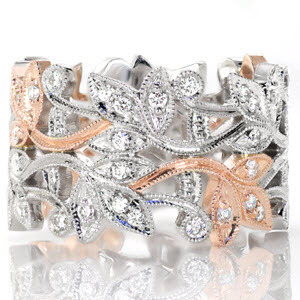 Flowing vines are adorned with leaves and flowers that have been fashioned out of precious metals and gemstones. 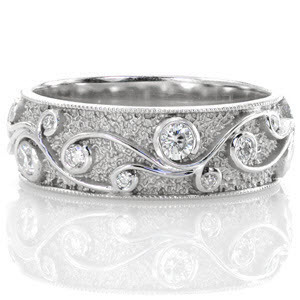 Some of these bands feature free-flowing borders, while others are framed with bands of micro pave. 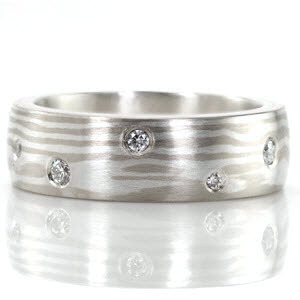 Minimalistic designs that highlight brilliant, dazzling diamonds, and lustrous high polished or satiny brushed metal. 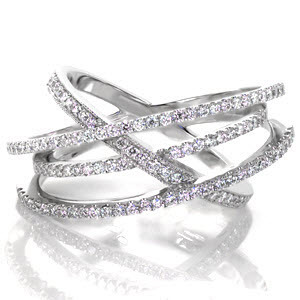 These rings also often feature geometric elements or movement in the band to create dimension. The stunning wood grain patterns of these designs are created from scratch each time, so every ring is truly one-of-a-kind! 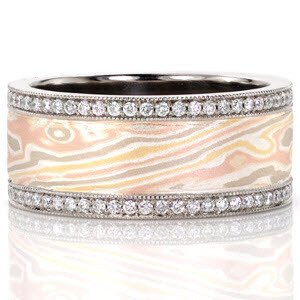 These bands are easily customized with different color combinations and the addition of diamonds or gemstones. The breathtaking patterns shown are all hand-carved into the metal of these rings with a sharpened steel tool called a graver. 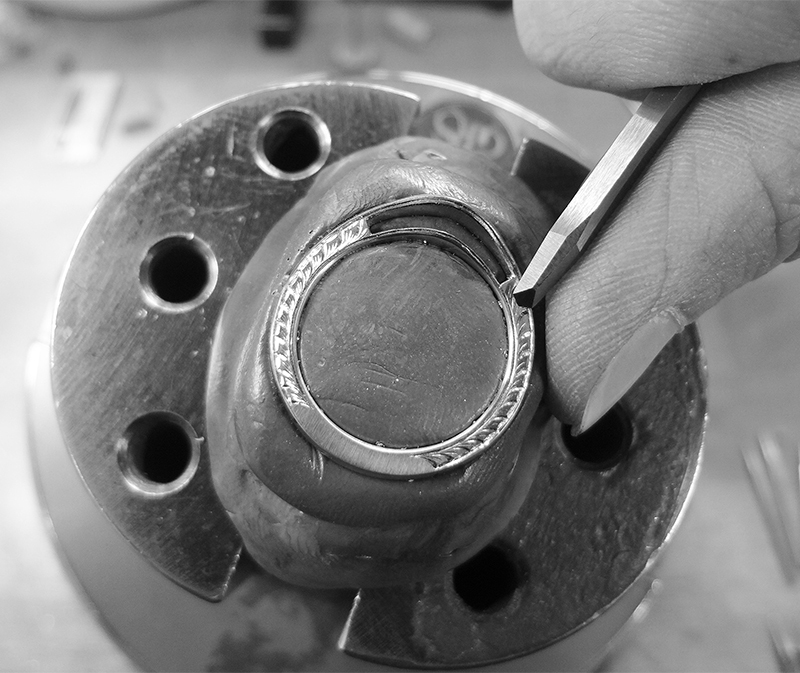 When the jeweler creates these intricate designs, they must be very precise with each and every line they make. Changing the pressure and depth of their strokes as they carve into the metal produces dimension when the light hits the engraved design. 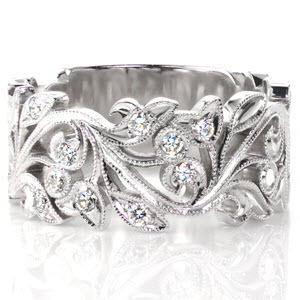 Filigree curls of all shapes and sizes create a beautiful movement within a design. These scrolling lines can easily add vintage inspiration to a ring. 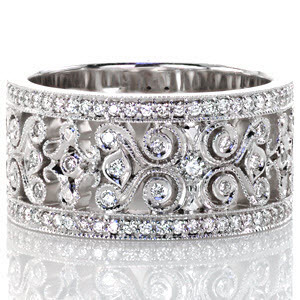 Many times the sweeping line of metal is accented with diamonds or gem stones, hand engraving, and a beaded milgrain texture. 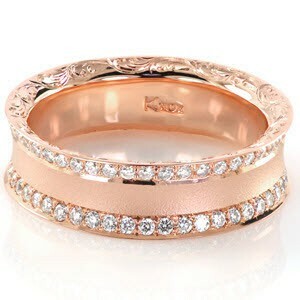 At Knox Jewelers, we’re here to help you design the custom wide wedding band of your dreams. 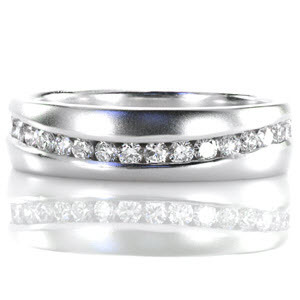 Or, if you are not currently looking for a wedding band, we can help you to design the perfect ring for any context. 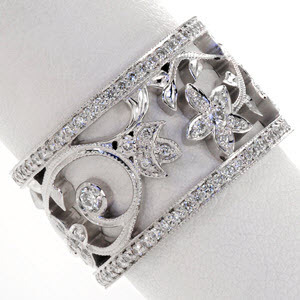 Any of our pieces can be created with or without a center stone. If you have any questions about the process, or if you just want to get in touch with us, please contact us right away. We are always happy to answer any questions you may have. At Knox Jewelers, we don’t just create stunning jewelry for women – we also specialize in designing men’s wedding bands of all kinds. 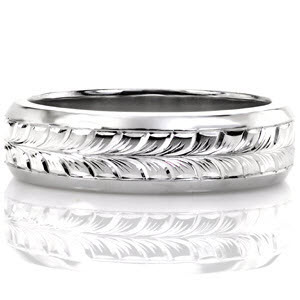 The origins of men’s wedding rings go all the way back to the matrimonial culture of ancient Egypt, wherein rings of braided hemp or reed were used to symbolize the eternal unity and love of the wedded couple. 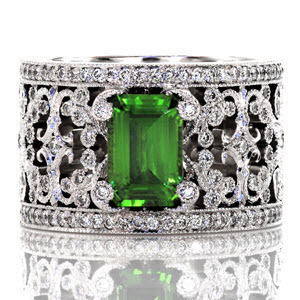 As the ages progressed, new kinds of styles came into and out of fashion, including gimmel rings, poesy rings, and more. However, the ritual of double-ring ceremonies did not develop in the United States until around the late 1940’s. 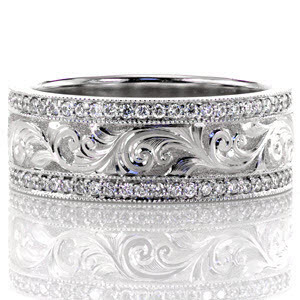 Since that time, a variety of styles have taken hold in popular opinion, and customers today who are looking to have a custom, handcrafted wedding band produced to symbolize everlasting love and marriage have the ability to choose from a vast number of unique styles and variations on classic designs. 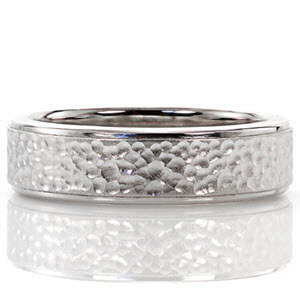 Let’s take a look now at some of the different styles of men’s wedding bands we have handcrafted here at Knox Jewelers for our gentleman customers in the past, who – to say the least – have been extraordinarily happy with the final design and product. 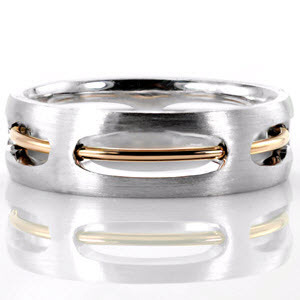 The archetypal wedding band is the classic style, usually consisting of a relatively simple design, smooth curves, clean lines, and yellow gold, though subtle variations on these attributes do exist. At Knox Jewelers, we can take a classic design and give it a refreshing, innovative set of modifications to make it uniquely yours. Whether you are looking to incorporate a different kind of metal for the band, or if you are seeking a custom set of modifications on an existing design, we would be more than happy to work with you on crafting a ring that will symbolize your eternal love. 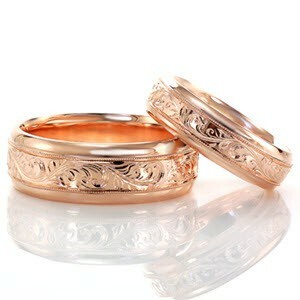 Those individuals looking for a more vintage style of ring ought to consider a hand engraved wedding band. 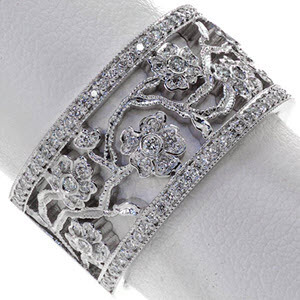 Our expert metalsmiths and artists at Knox Jewelers can take this style in a variety of different directions, and many different patterns can be crafted. 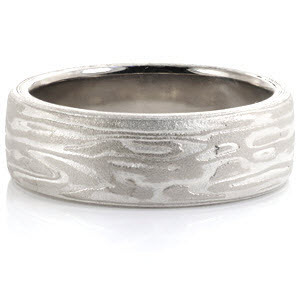 For example, let’s take a close look at our North Shore Hand Engraved Wheat wedding band. 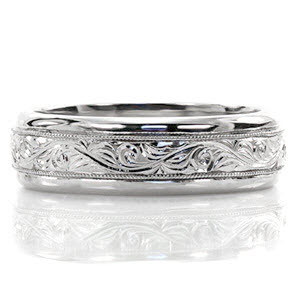 This exquisite ring uses 14k white gold in concert with lovely wheat pattern around the center of the band. Naturally, the engraved pattern can be customized with your own unique design. 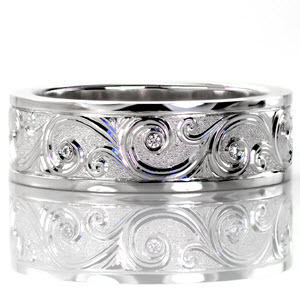 Also of interest to you may be our North Shore Hand Engraved Scroll ring. 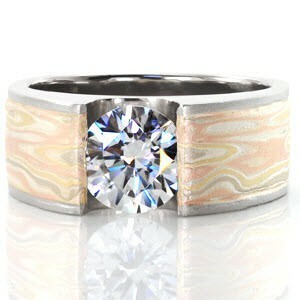 Some of the most unique wedding bands we have created for our customers in the past have been Mokume Gane wedding rings. We have written about it before, but here is the short story on the art of Mokume Gane. 17th century Japan gave birth to a unique set of techniques for combining multiple metals into a flowing design which emulates the patterns of nature. At Knox Jewelers, we craft each and every one of our Mokume Gane rings from scratch, and they are some of our most beautiful works. 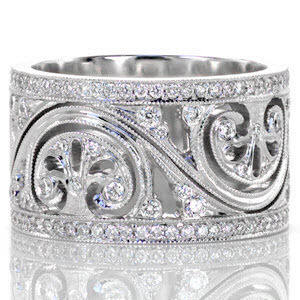 Our contemporary wedding bands incorporate a variety of different flourishes, including diamonds, gemstones, many types of finishes, geometrically-inspired shapes, and more. 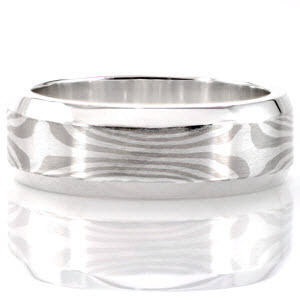 We also make extensive use of decorative lines and negative space to craft the most unique wedding bands around. Create custom wedding bands for our valued customers is our vocation, and we are proud to have crafted so many unique and beautiful designs for our customers throughout the years. 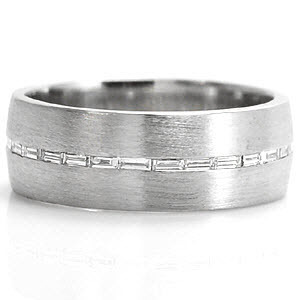 Have a look at our entire portfolio of men’s wedding bands to see more examples of our work. 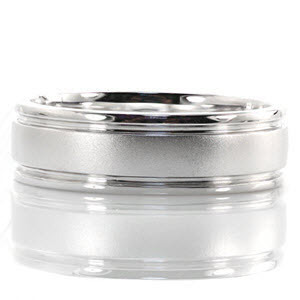 As you might imagine, we are very proud to have had the opportunities to design these beautiful wedding bands for our past customers, and we are more than happy to answer any questions you may have about designing custom men’s wedding bands. 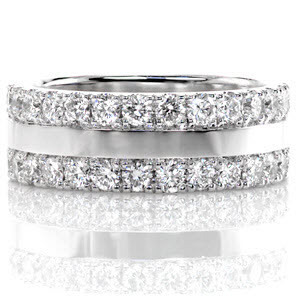 We look forward to working together with you to design the perfect wedding band! Why should you choose to invest in vintage wedding rings? 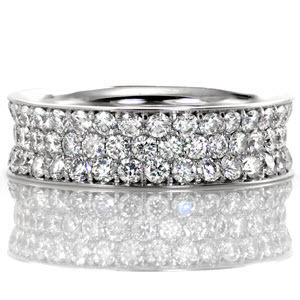 After all, what makes them so much more special than any other ordinary set of wedding rings? To answer these questions, let’s step back for a moment and think about what wedding rings symbolize. When you choose to spend your life with your beloved, you are forging a bond that will last through the ages, a bond that is full of love, happiness, and is impenetrable to outside forces. 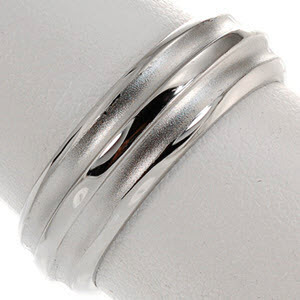 Your wedding ring is a symbol of this eternal, beautiful unity, so why would you choose to represent this unity with a bland, factory-made piece of metal? It is probably not difficult for you to agree with us when we say that representing your timeless bond is far better suited to a handcrafted, unique wedding ring that distinctly encapsulates your special vow. At Knox Jewelers, we are artisans who take great pride in producing only the finest and most extraordinary wedding rings that have the power to capture and express the true meaning of your marriage. 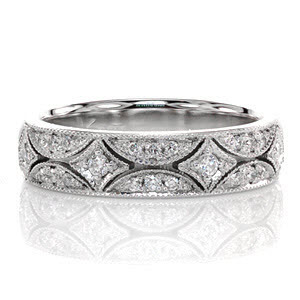 There is no typical vintage wedding ring in our studios. All of our handcrafted, unique wedding rings have specific properties and attributes which imbue them with an individual character, very much unlike ordinary, industrial-fabricated bands. 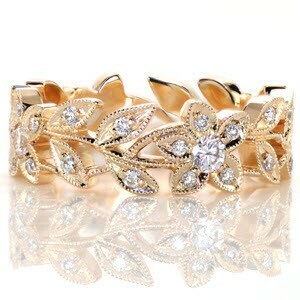 A few of the techniques and flourishes we painstakingly use in crafting these works of vintage art include hand engraving, hand formed filigree and milgrain, and the use of high quality gold and diamonds in perfect harmony. What truly gives our wedding bands a timeless, vintage quality is the delicate interplay of all of their constituent elements – the dance of gold and diamond, the handcrafted filigree and engraving, and the holistic attention to detail that our artisans pay to each and every one of our unique bands. 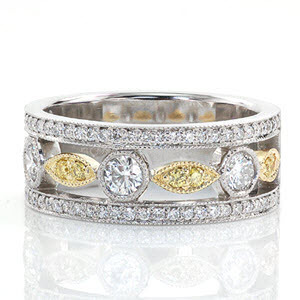 Speaking of gold, white gold is a modern trend, and using yellow gold is a great way of adding a vintage feel to your ring. 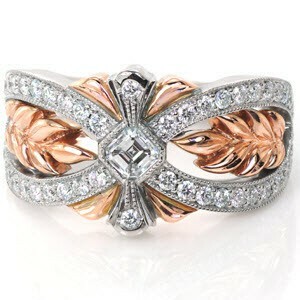 Rose gold, though also a modern trend, is just as effective in creating the vintage look-and-feel. Capturing the vintage aesthetic is the ultimate goal of our expert artisans, and we think that you will agree upon browsing our fine selection that we have overwhelmingly succeeded in this mission. All of our vintage wedding rings are made by hand by our brilliant and talented artists and metal smiths, in house. There is a world of difference between the quality work of our craftsmanship and the lifeless kind that comes from a factory. By having complete control over the design and crafting of our unique wedding rings, we can control the creation process down to each individual element, thus giving us the ability to craft a wedding band which perfectly explicates the true meaning of your marriage. The generic products produced by industrial machines cannot keep up with our artists. 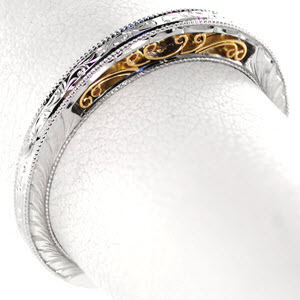 The machines and industrial processes employed by other jewelry companies simply do not have the artistic minds required to produce wedding rings which have their own unique, innate, and individual characters. Factories will consistently produce substandard results because at the end of the day nothing can replace our talented artists and their exquisite craftsmanship. These types of vintage wedding rings have a timeless, eternal appeal, and for good reason, too. These styles stand the test of time and have traveled through countless generations with no fall in popularity across the ages. Why? The answer, again, lies in the symbolism and rich meaning connoted by a handcrafted vintage, unique wedding ring. 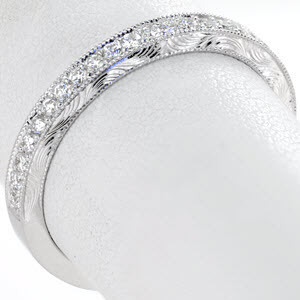 Many of your parents, grandparents, and great grandparents likely had rings which had many of the attributes and elements that our own vintage rings possess – think of our rings as a way of connecting with your past and ancestry. We expertly craft all our rings with the tender loving care they deserve, and their resulting elegance, intricacy, and beauty are unmatched. 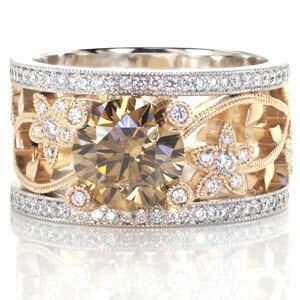 Ultimately, a vintage wedding ring is a symbol of your love for your spouse and a future heirloom for your family. Timelessness, rich meaning, and beauty – these are just a few of the qualities of our handcrafted vintage wedding rings, and we know you will love browsing our selection. At Knox Jewelers, we can provide custom, handcrafted design services to turn your ideas into reality, and we look forward to working together with you to design a vintage wedding ring which will stand the test of time and be a symbol of your marriage.